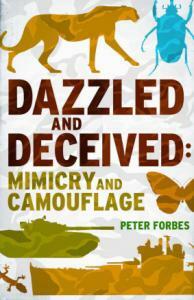 The British journalist Peter Forbes has produced a colorful look at camouflage in nature and battle, with a focus on the two world wars. “Dazzled and Deceived: Mimicry and Camouflage’’ (Yale University) straddles the worlds of evolutionary biology, art, and military strategy with a world-class cast of characters, among them Charles Darwin, Pablo Picasso, Vladimir Nabokov, Theodore Roosevelt, and Winston Churchill. A pivotal character is Abbott Handerson Thayer, the eccentric New England painter who studied the animals near his summer home in Dublin, N.H., and is one of the few artists to have a scientific law (Thayer’s Law of Concealing Coloration) named after him.